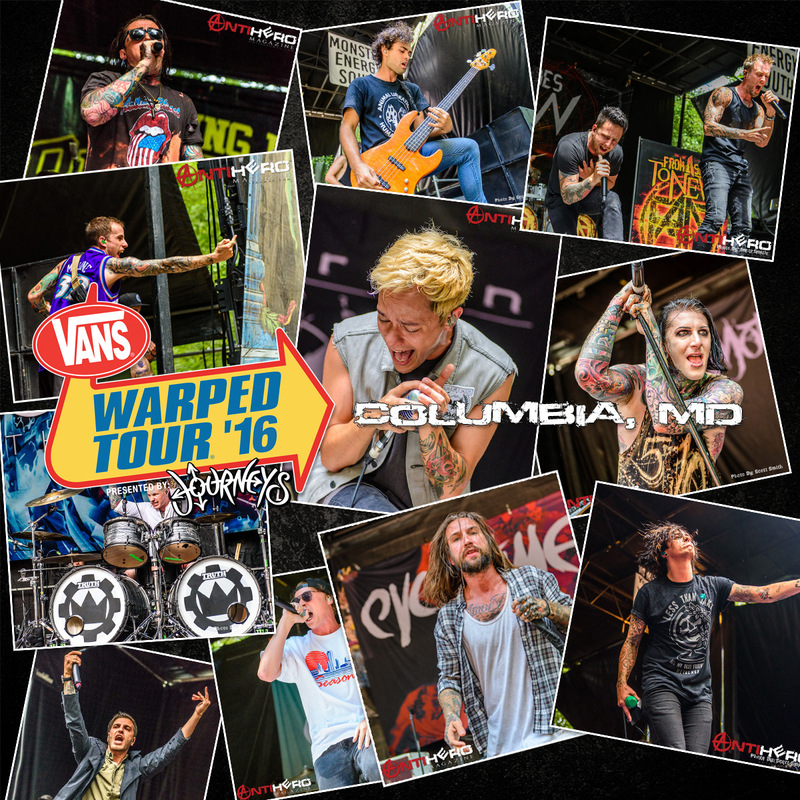 The mega festival that is the Vans Warped Tour visited the Merriweather Post Pavilion in Columbia, Maryland on July 16. The Merriweather is a large outdoor amphitheater that is rich in music history. The covered pavilion has one large stage, but when festivals visit additional stages are added in and around the wooded grounds that surround the main performance area. It was hard to imagine there would be enough space to accommodate eight stages for the Warped Tour, but somehow tour organizers fit them all in and their layout was perfect. Walking around the venue was visually stimulating, and at times overwhelming, as there were many merchandise tents and informational tents, as well as water stations and a slip and slide to help attendees escape the heat. There was so much available for attendees, that one would need more than a full day to soak in everything that was offered, but this is what makes the Vans Warped Tour great. The ticket cost is low, but the amount of content available is immense. To top it off, there is no need for parents to be fearful of allowing young concert goers to attend a large music festival as each attendee can bring one parent in for free. On this 90-degree day, over 50 bands were scheduled to play. A large board containing the set times was available if you wanted to write down the bands you wanted to see, but purchasing a $2 printed schedule was much more efficient. After perusing the schedule, difficult decisions had to made to determine which bands to watch and which bands to skip. It’s impossible to see them all. The Journeys Left Foot and Right Foot stages drew huge crowds throughout the day as each hosted several popular acts including We The Kings, Sum 41, Falling in Reverse, and Sleeping With Sirens. Not to be outdone, the Monster Energy North and South stages drew large crowds of metal heads as they were treated to bands such as Motionless in White, The Word Alive, Whitechapel, Coldrain, From Ashes to New, and Veil of Maya, to name a few. Sadly, there were two stages we only visited briefly and two others that we didn’t get to visit at all as there wasn’t enough time visit each of them. The final piece to any successful festival, is the crowd and the festival goers at the Merriweather were an impressive group. Most in attendance seemed to be in their late teens to twenties, but there were plenty of older rockers in attendance as well. The crowd was huge, so much so that at times you had to walk completely around them as it was impossible to cut through all of the people. Those in attendance were a vibrant and energetic bunch and there was no doubt that the bands fed off their energy during performances. At the Journeys’ stages, fans sang, chanted, and waved their arms in unison while fans at the Monster Energy stages head banged and threw the horns all day long. Seeing faces with wide smiles was a common sight throughout the festival. As the festival wound down to its final acts, organizers methodically began taking down all of the tents and booths so they could be packed up for another day. With the enormity of the Vans Warped Tour, it’s an impressive feat to be able to set up and tear down everything day after day, but somehow they get the job done and they do it well. There’s no doubt they learned a trick or two about efficiency in their 21-year existence.